Several weeks ago when I first read Chick Fil-A CEO, Dan Cathy’s interview with Baptist Press where he expressed his beliefs about traditional marriage, I told the wife that the gauntlet had been thrown down and that an uproar was forthcoming. "We operate as a family business ... our restaurants are typically led by families; some are single. We want to do anything we possibly can to strengthen families. We are very much committed to that." "We intend to stay the course. We know that it might not be popular with everyone, but thank the Lord, we live in a country where we can share our values and operate on biblical principles." As Americans, we can all agree to support everyone’s first amendment right to speak their opinion (including Cathy’s) but we have to be realistic enough to realize that when we speak openly on topics that not everyone agrees on, backlash will ensue. Cathy appears to be a shrewd businessman and has put his integrity and beliefs before worshiping the almighty dollar which is commendable these days. Unfortunately, what has resulted is heightening of the great devide between Bible thumpin’ “Christians” and those who oppose bigotry based on sexual orientation, which goes well beyond those of the LGBT community. As we sit in the year 2012, anyone who does not have gay friends, co-workers, and acquantences is either blind or living with their heads in the sand (or up their a__). There are many “Christian” couples that have good marriages as well as many gay couples that would have good marriges if all things were equal. One type of “marriage” is allowed in all 50 states and the other isn’t. So why do we have one side lining up to eat tons of marginal chicken product on August 1st, while the media is creating a war and trying to draw many others who would like to live peacefully as gay couples into the middle of the malstrom? Predators Captain Shea Weber was an early promoter of You Can Play when he shared the following video with Carey Price. Maybe I’m in the minority of those who follow Jesus Christ but instead of having a day of protest and hate on August 1, I challenge our readers, hockey fans, and everyone else to do something positive to celebrate the day. Go to YouCanPlayProject.org and join all those that believe in safety and equality for all on and off the ice regardless of their sexual orientation. Let’s turn a day of hate and anger into one that promotes a positive message. 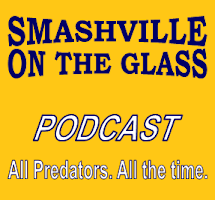 Nashville Predators CEO Jeff Cogen and USA Today's Kevin Allen joined Ryan Porth and me on this week's episode of SmashvilleOnTheGlass Radio. Cogen details the process that the Predators went through to put together the package to wrap up the captain for 14 years. Allen discusses the national implications of the signing and covers several other interesting topics. It's rare that we see what Predators players are up to in the offseason. I ran across a little video from RumorFix with a report of Mike Fiisher and Carrie Underwood at Disney World on Thursday. Fun stuff! With Shea Weber wrapped up as team captain for the next fourteen years, and Pekka Rinne behind him for half that time, the Nashville Predators appear set for another season where they realistically have a shot at the Stanley Cup. All the gnashing of teeth that has been ongoing since the Preds beat the Red Wings in five games in April appears to have abruptly come to an end on Tuesday when the Predators matched the Philadelphia Flyers 14-year, $110 million offer to retain Captain Weber. Tom Cigarran, leader of the Preds ownership group, was a happy man at Wednesday's press conference in spite of busting open the collective piggybank to be able to shell out the big bucks to keep Weber wearing the gold sweater. "It’s a good day to be a Predators fan, and even better days lay ahead of us," Cigarran exclaimed. He then detailed the collective parts that led to the decision to sign Weber. "At the Predators, we have a three-way working relationship among Ownership, Hockey Operations and Business Operations. Owners provide the basic funding for the team and make sure we have the very best leadership throughout our organization. Hockey Operations job is to make sure that we have an elite, winning franchise on the ice year after year. Business Operations’ job is to make sure we operate as an elite franchise off the ice and that our current fans have reasons to continue their active support of the Predators and that we create new fans every day. These three parts of our organization work very hard, very effectively, and seamlessly to get us to the decision to make Shea Weber our team captain and leader for the next 14 years." Today (Wednesday) at 12:30, the Nashville Predators plan to open up the Bridgestone Arena plaza for one of the biggest celebrations in team history as Tom Cigarran, David Poile and Jeff Cogen will address the crowd at 1 p.m. in their first public appearance since Shea Weber became a Predator for the next 14 years. For those locked in an office or otherwise unable to attend, streaming video will be avaliable here. The six day period of silence in Smashville in reacting to the Philadephia Flyers 14-year, $110 million offer sheet was finaly broken Tuesday afternoon with the formal announcement from Preds GM David Poile that Nashville would match the terms of the Flyers offer. This should allow Predators' captain Shea Weber to play out the rest of his career in Music City and allow the Preds to move forward on other potential deals to finalize this year's team. The Nashville Predators summer of discontent worsened with a massive "bunker-buster" bomb blast from the Philadelphia Flyers in the early morning hours on Thursday when the news leaked that Preds' captain, Shea Weber, had signed a $110 million, 14-year offer sheet with the bad boy team in the Eastern Conference. The Predators have little choice but to match the offer before next Wednesday's deadline. It appears that the Flyers tired of negotiating with Preds GM David Poile on a possible trade and just upped the ante by throwing out the offer that defined the market value for the best all-round young defenseman in the game. It was common belief that Weber would either be re-signed to a long term deal similar to the one Ryan Suter signed or be traded to another team for a king's ransom. Poile's mantra all summer has been that he would match any team's offer sheet for Weber which was supposed to ward off such attempts. Flyers GM Paul Holmgren put Poile to the ultimate test, front-loading the deal with $68 million in signing bonuses and offering to shell out $80 million in the first six years of the contract. I'm sure the Preds were prepared to pay a similar total amount but not so much so soon. Ryan and Buddy catch up with the CBC's Elliotte Friedman and cover a wide range of topics including Ryan Suter, Shea Weber, and the upcoming CBA negotiations. Section 303's Jeremy Gover also joins in for a round-table discusssion on the Predators future. The NHLPA released the list of 16 NHL player that opted for player elected arbitration under the current rules of the Collective Bargaining Agreement. The Predators' Shea Weber chose not to participate this year after getting a bitter taste in his mouth at last year's team elected hearing where he was awarded a one-year contract for $7.5 million. The Predators' main focus will be to sign Weber to a long term deal that could make him the highest paid NHL defenseman. Teammate, Sergei Kostitsyn decided to take a shot at the arbitration process to attempt to improve on the $2.5 million that he made this past season. The flip side of the matter is that the Preds could chose to walk away from an award if they do not like the amount. Additionally, the team and player could agree to a contract before the hearing. David Poile spoke to the national media via conference call just minutes after finding out that the the Nashville Predators "were not going to be the team of choice" in the Ryan Suter contract negotiations. Poile indicated that he was "disappointed and surprised" in Suter's choice of signing with the Minnesota Wild. He indicated that he had had "30 to 40 discussions with Ryan and his agent as to signing a long term deal and Ryan's importance the club." Suter's primary indication was that the criteria that he was looking for was being a part of a "winning team." Poile pointed out that "no team in the league did more at the trading deadline" than the Predators. Suter's camp indicated to Poile that "it was not about money," but for "family reasons." Poile said that was "not what we talked about all season long." Going forward, Poile indicated that the focus would turn to Shea Weber and trying to sign him to a long term deal. "We want him (Weber) to be in Nashville for years to come." Poile admitted that re-signing Weber will not be an easy task. "If Ryan had re-signed it would have been easier for Shea to commit." Poile's main sales pitch to Weber will be that "he is the captain of the team and they they want to build the team around him." In addition to attempting to re-sign Weber, Poile will also be looking for a replacement for Suter via "a trade or free-agency." He indicated that he would be looking for "the right player with the right fit." Even with the departure of Suter, the Predators have a bright future on the blue line with Weber, Kevin Klein, Hal Gill, Ryan Ellis, Roman Josi, and a host of prospects waiting in the wings for a shot at the NHL. Thanks to Petw Weber for the audio of David Poile's conference call. According to Michael Russo of the Minneapolis Tribune, ex-Predator Ryan Suter has signed a 13 year contract that should make him a Wild for the remainder of his career. No terms were immediately available but it was reported on Tuesday that Detroit had offered $90 million in a 13 year deal. The Wild also signed ex-Devil Zach Parise in what could be a similar 13 year offer that would unite the two Team USA stars and friends. In Smashville, all eyes now turn to Shea Weber to see what he will do. Preds GM David Poile has repeatedly said that once Suter was resolved he would make an offer to Shea Weber who is a restricted free agent now and could become unrestricted at the end of next season if the CBA age rules do not change under a new agreement. Also, look for Poile to possible pursue free agent Matt Carle or possibly trade for a D-man like Paul Martin who is with the Penguins. So stay tuned as the hockey news never stops in Music City in spite of the torrid 100 degree heat. In the last 24 hours, the Nashville Predators continued to piece together the puzzle that will be the final product that will hit the ice in October. Since Hal Gil signed last week, the Predators have added Paul Gaustad, Brian McGrattan, Chris Mason, and minor leaguer, Kevin Henderson. The one piece that remains an unknown is that of Ryan Suter. David Poile met with the media late Sunday and sounded like he was becoming increasingly impatient with Suter's indecision. A video of the discussion can be found here. The re-signing of Gaustad is significant as it brings back the game's best face-off specialist and adds stability to the penalty kill team that was the leagues best last season. The retutn of Chris Mason will make every Predator fan smile. Chris played parts of six seasons in Nashville and was a favorite among fans, coaches and teammates and will be the perfect complement to Prkka Rinne in goal. He had his best years under goalie coach Mitch Korn and he should returtn to that form again. McGrattan's re-signing insures that the smash will remain in Smashville. His play down the stretch last year was limited due to injury and the competitiveness of the playoff race. The big guy is the best enforcer that the Preds have ever had and fans will be thrilled to see him in action once again.